Where a mountain lover’s dreams come to fruition. The Rockies (they go beyond Canada) stretch more than 3,000 miles across North America, from Western Canada down to New Mexico. 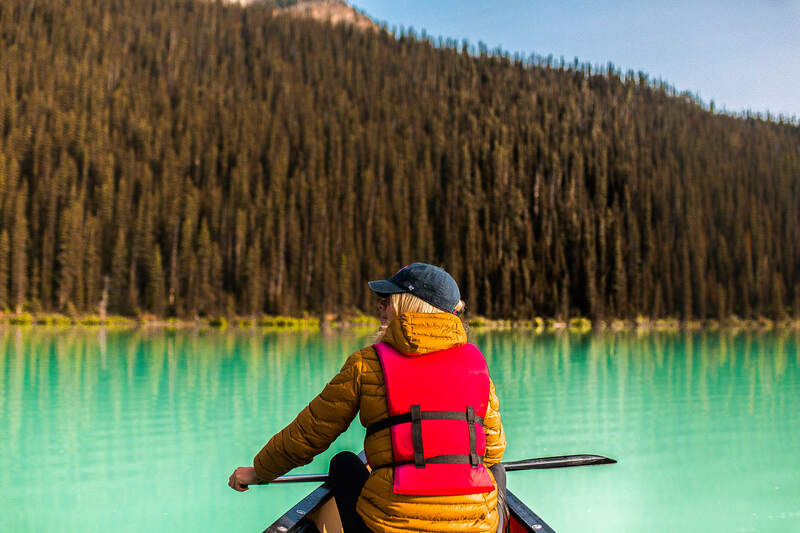 Home to 11 national parks across Canada and the USA, it’s no surprise that they’re a popular destination for hiking, camping, mountaineering, fishing, hunting, mountain biking, skiing, and snowboarding. 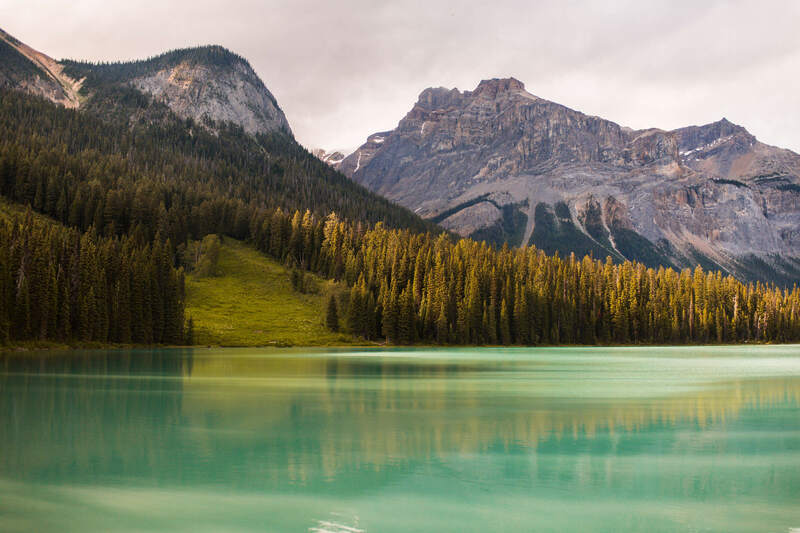 The Canadian Rockies are home to five of these eleven National Parks of which, on my recent road trip, I visited three: Yoho, Banff and Jasper. The other two go by the names of Kootenay and Waterton. Fun fact: The highest peak in the USA is Mt Elbert at 4,401m, and in Canada it’s Mt. Robson at 3,954m. 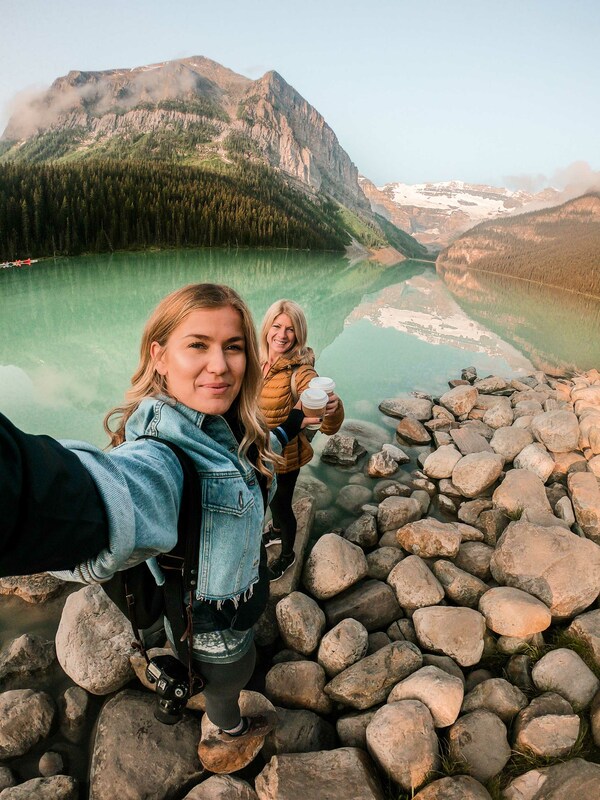 Last month (July 2018) I hired a car from Budget Rental at Calgary Airport, picked up my Mumma who had flown in to join me from the UK (you can fly direct) and together we embarked on a 7-day adventure exploring this rugged landscape that spans the provinces of British Columbia and Alberta. 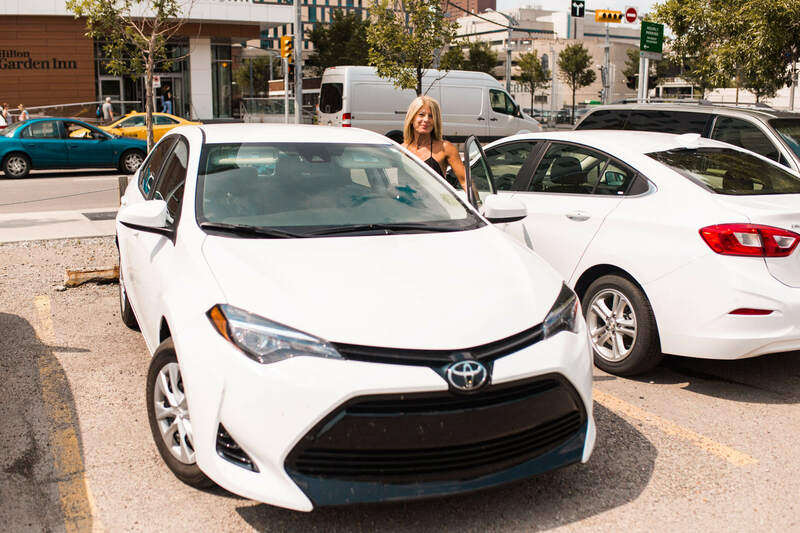 We headed out on a spontaneous road trip and we turned up with nothing booked prior. 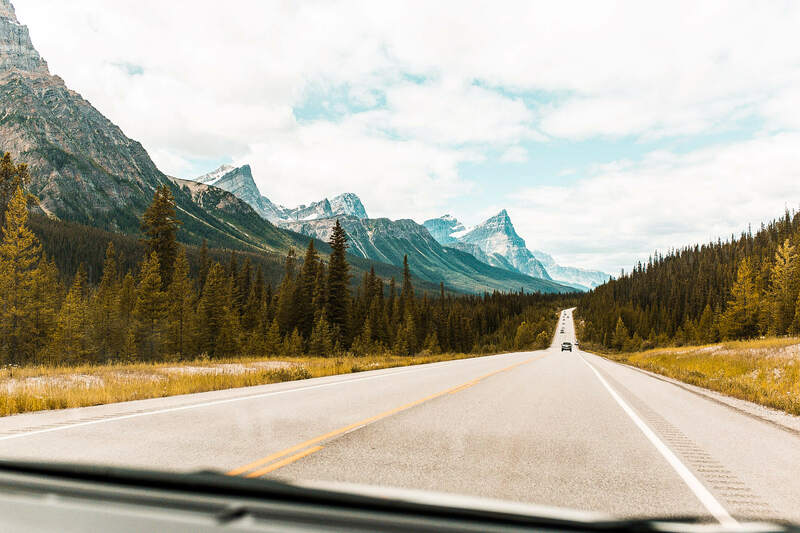 (If you read my ‘Ultimate Guide to a summer in Banff’ you’ll know this spontaneous approach had us come across a fair few difficulties during ‘peak season’ but regardless we embraced the adventure and had the best trip together). Top tip: If you’re travelling in peak season, get your hotels booked up ASAP or prepare for the extortionate costs on basic accommodation. Availability was shockingly low booking last minute and we found nothing cheaper than $300 a night for two of us. Top tip: Everything I’ve mentioned in this post has been marked on the Google Map below so that you can see the exact location. Open this blog post / map on your phone and use it to navigate when you’re there! After a long flight from the UK, Mum and I decided to take the afternoon to relax in Calgary before heading out on the road the following morning. We booked a basic Airbnb in Calgary, went to the mall to get a SIM card for the week and ate at Ten Foot Henry’s. Top tip: Ten Foot Henry‘s served up possibly some of the best vegetarian food I’ve ever had in my life. So much so, we came back without a second thought at the end of our road trip. Top tip: I got a prepaid SIM card from Tbooth in the downtown mall for $52.50 which gave me a load of minutes and texts to Canadian numbers, and then 6GB of internet to use for work, GPS and music streaming… obviously. By 7.30am we were up, washed and ready for the adventure. 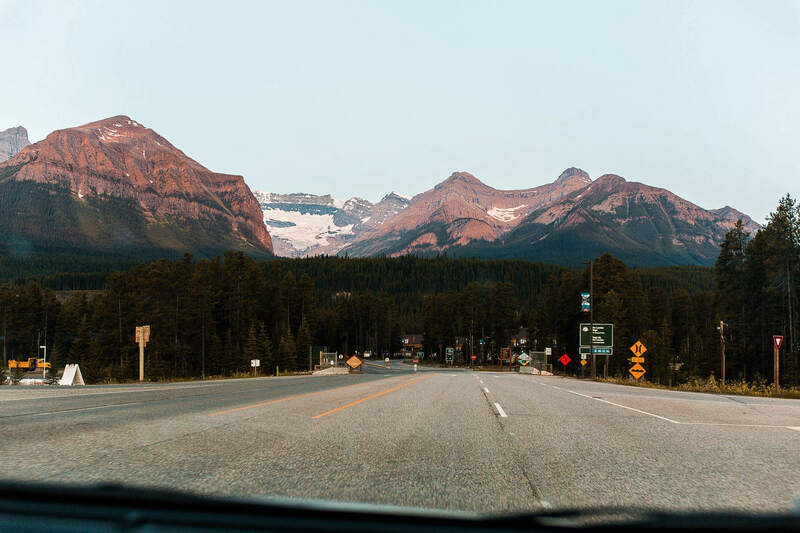 We popped our suitcases in the car and headed straight in the direction of Banff. 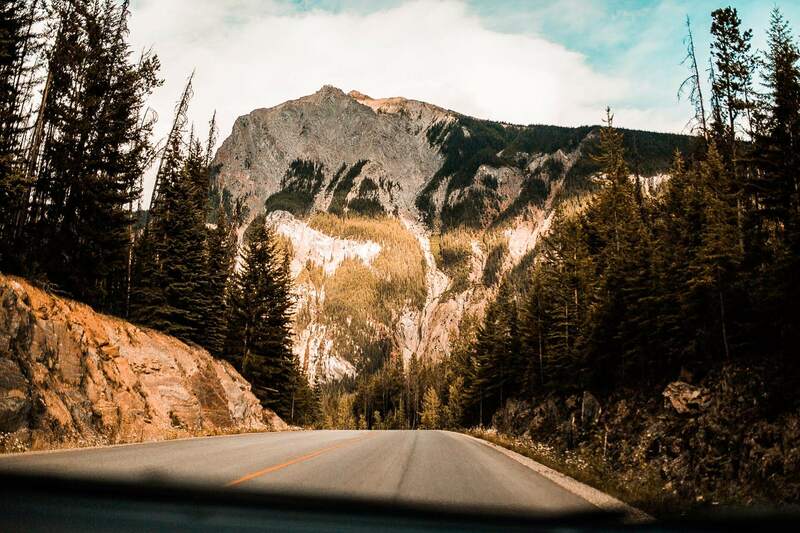 The drive from Calgary into Banff is an insane one. 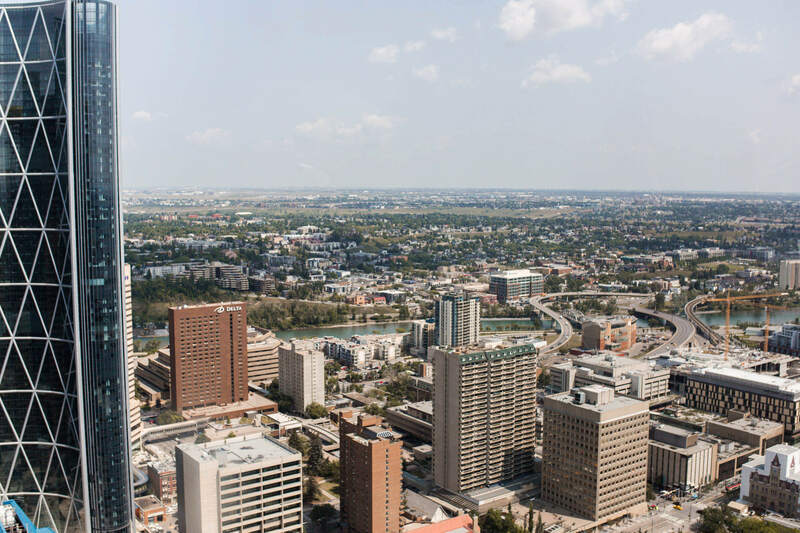 Calgary is ridiculously flat and of course Banff is in the heart of the rockies so watching that landscape change so dramatically over just an hour and a half is crazy. We drove straight into the centre of Banff by which point we were ready for some fuel. 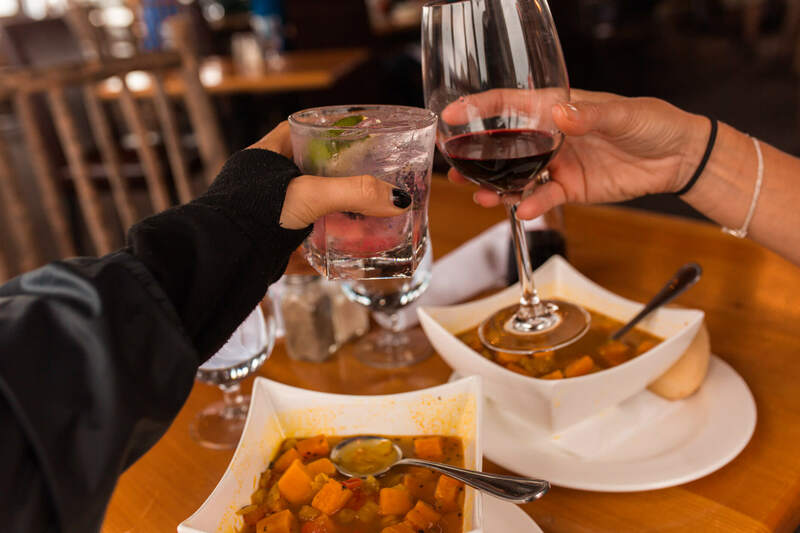 We stopped off at Coyote’s Southwestern Grill before popping into the visitor centre to pick up some guides on the local area and possible hikes. 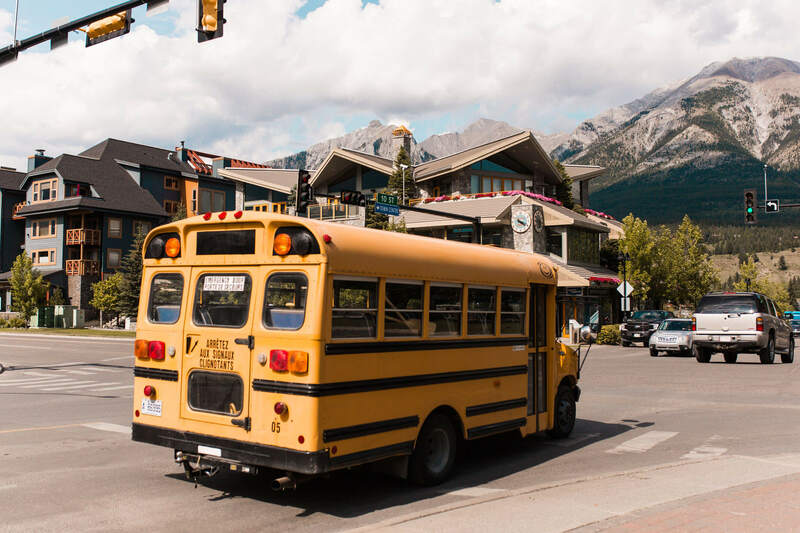 See my ‘Ultimate Guide To Banff During Summer‘ here. Eager beavers and filled with energy we headed straight out on our first hike – up to Banff gondola. 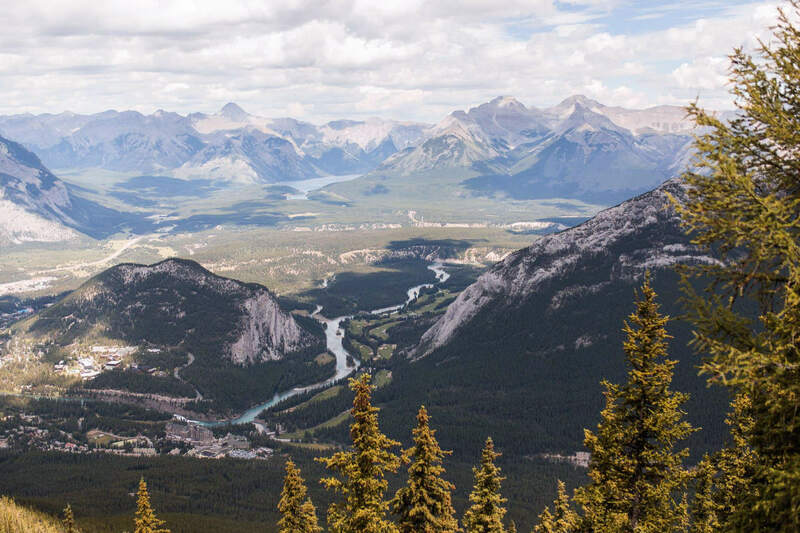 Sure, you can get the 8-minute gondola all the way up and back down again to the car park, but alternatively you can sweat out the 6km trail up to the observation decks, which stand at 2,282m and give you 360 views across Banff and the surrounding areas. It’s a 1.5-2 hour hike but we did it in about an hour for a serious sweat out. Top tip: It’s quite steep in areas. If you’re pushing the pace, or if you’re not, be sure to take a bottle water with you. At the top there’s a cafe to treat yourself to a hot chocolate as you take in the views. 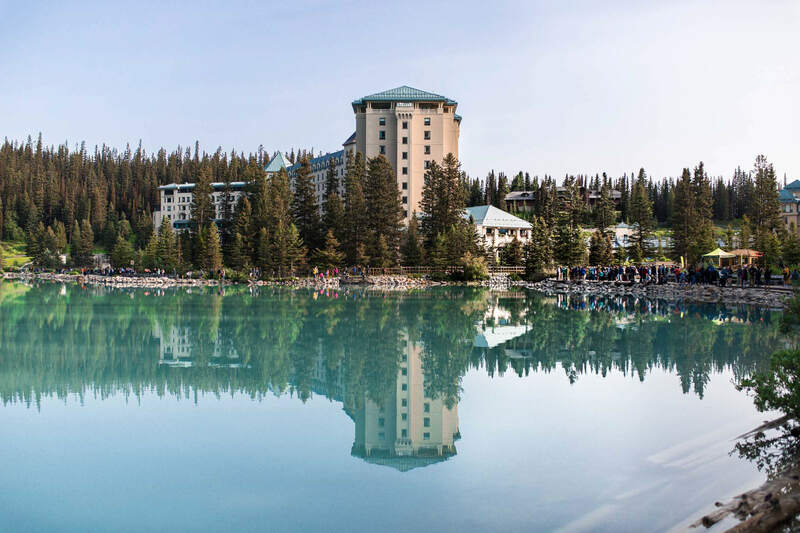 We descended back down to the car and had a quick look at the hot springs that everyone raves about, in Banff which are sat right by the same car park. It’s not visually very impressive at all, though I know the mineral water has some revitalising effects on the body. It’s an option if you fancy it anyway! A thermal water pass is $11.35 – find out more here. 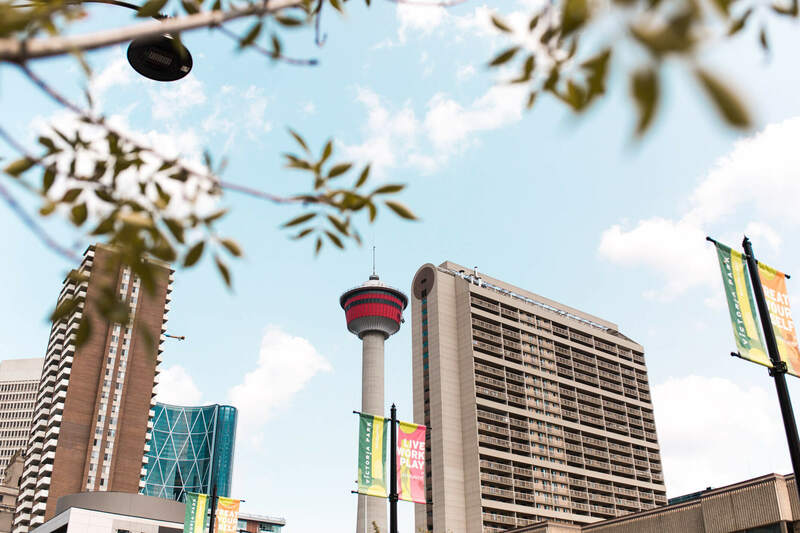 The summer days are long in Canada which is perfect for an area with as much to see as The Rockies, because you have so much daylight to use. 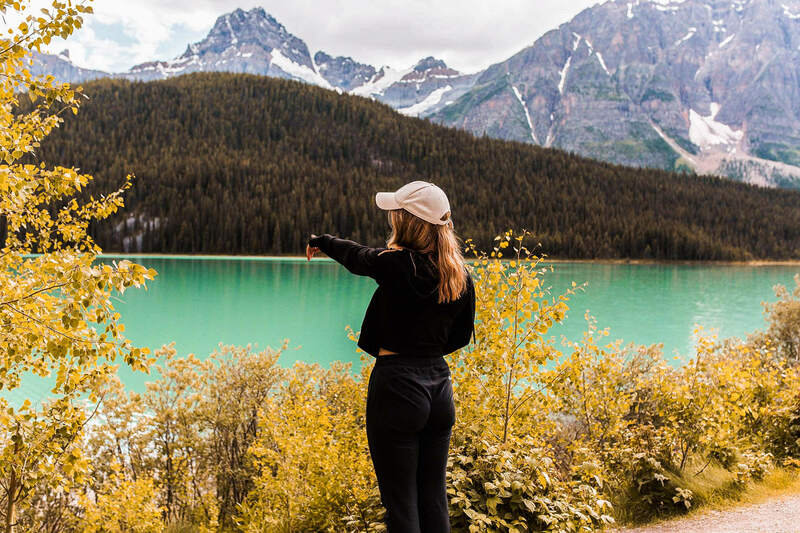 Should you turn up earlier, you have Yoho National Park here to explore further, or you could team up a visit to Emerald Lake with Wapta Falls. 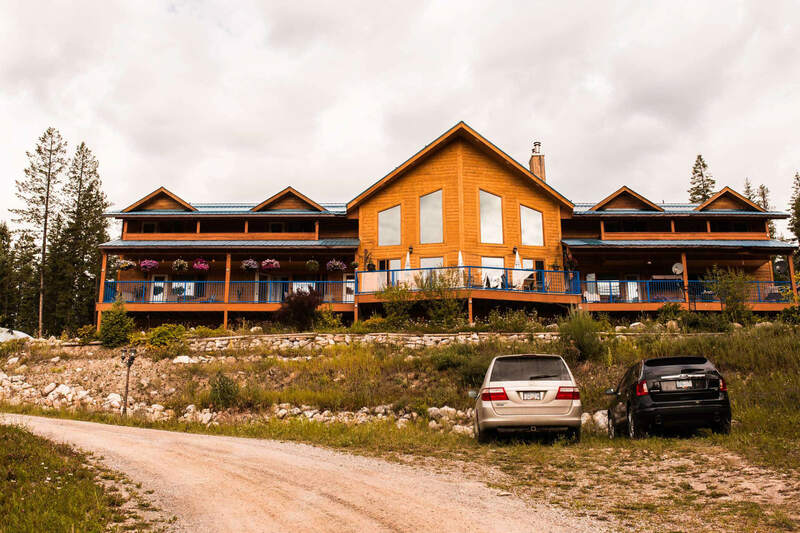 We rested our heads in the only thing we could find on booking.com that we could justify the standard $300 a night charge we couldn’t avoid – Glenogle Mountain Lodge and Spa. Happy at the thought of staying put for two nights, we booked another night here and left our bags safe for another complete day of adventure. Day 3 had us drive back towards Lake Louise to join Icefields Parkway and drive the up toward Athabascar Glacier. I actually visited Athabasca Glacier 3 years ago on one of my first ever press trips with Tourism Alberta. I remember the drive being so beautiful that I wanted to show Mumma around. 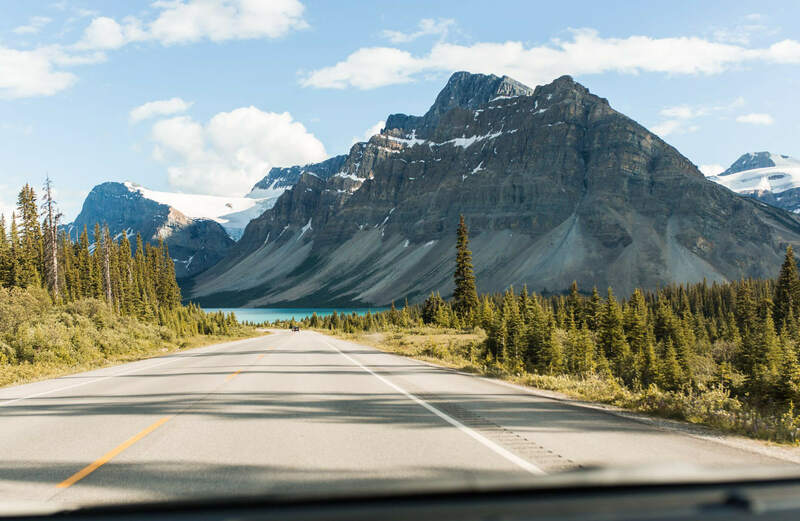 The Icefields Parkway is the 232 km highway connecting Banff National Park, Lake Louise and Jasper, surrounded by glaciers, waterfalls, mountains and forest. Top tip: The first place we passed after Lake Louise for petrol was at Sascatuhan river crossing (we paid $65 (2/3 tank)). 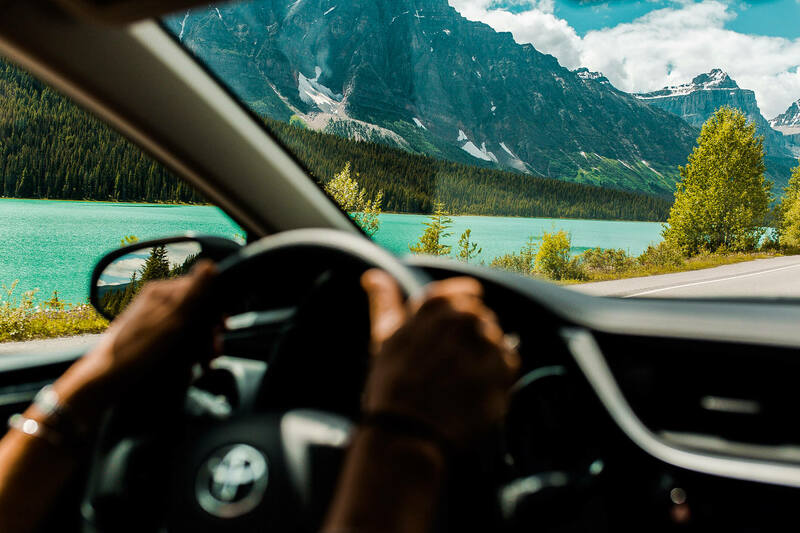 Just watch your petrol level on the road trip, you don’t pass stations all that often so keep it as full as you can then heading out for the day. Top tip: Beware of the bears. This is a very common place to spot bears on the road side. Keep your distance from them, for obvious reasons. Stay in your car where you can. I know it’s tempting to get next to a bear for that selfie for the ‘gram, but they are not cuddly toys. Repeat, not cuddly toys. 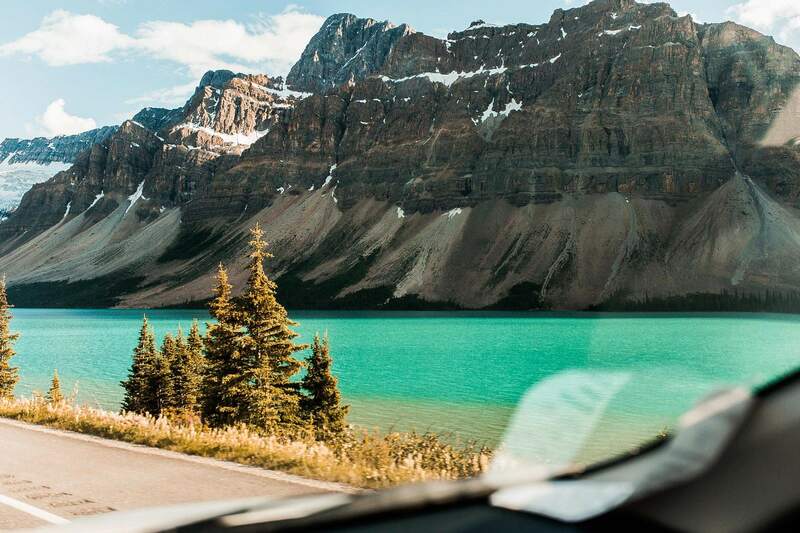 We drove past the most ridiculous lakes, including Peyto Lake, and we enjoyed lunch and a cup of tea on the loungers at Columbia Icefields Discovery Centre overlooking the glacier. 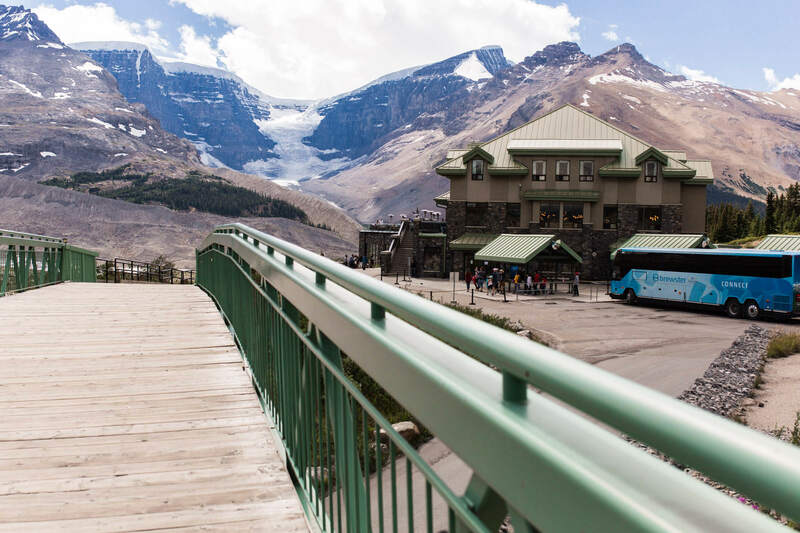 We decided not to do the Glacier Skywalk, which takes you onto the glacier itself with a guide (because I had done it before) but if you are looking to dig a little deeper, click here to find out more about the tour. [The centre is only open in the summer]. Also in the area is the SkyWalk and Icefield HeliTours for insane aerial flights over the turquoise lakes and mountains. By sunset we had returned to Glenogle Mountain Lodge and Spa having spotted a black bear, gazed across lake colours we still cannot comprehend, and wound around endless mountain roads and ridges. We slept very well indeed after a long hot bath. This morning we woke to the fresh and and views of the mountains one last time. 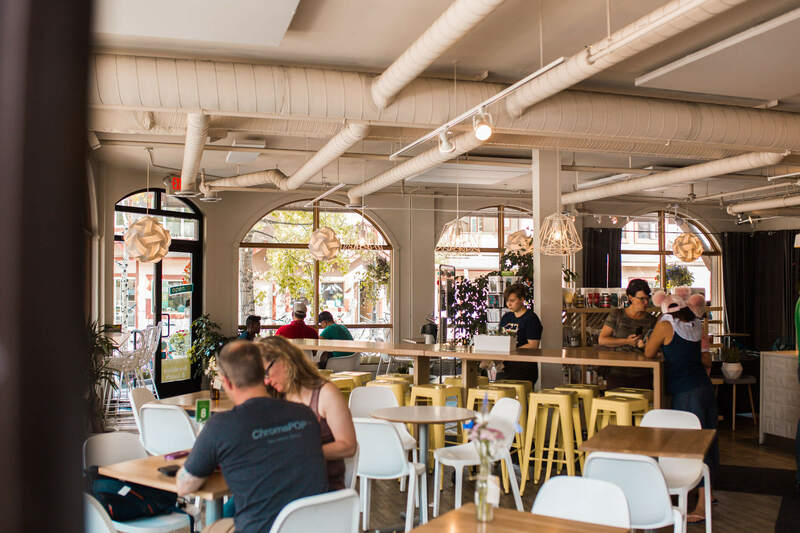 We packed up the car and headed for brunch at The Island in downtown Golden. You won’t miss it if you go. You drive over a little bridge into the centre of Golden and the rooftop restaurant is right there by the river. 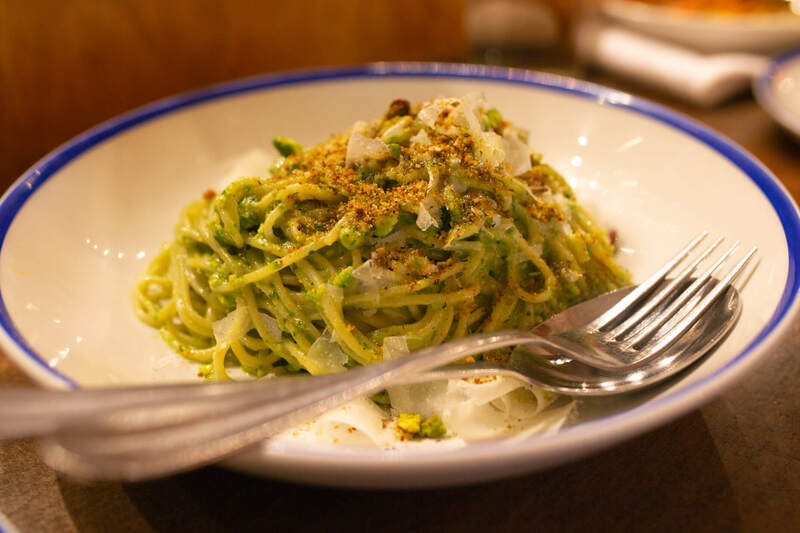 The food is incredible too. I had some yummy veggie quesadillas with guac and mum had a falafel wrap. 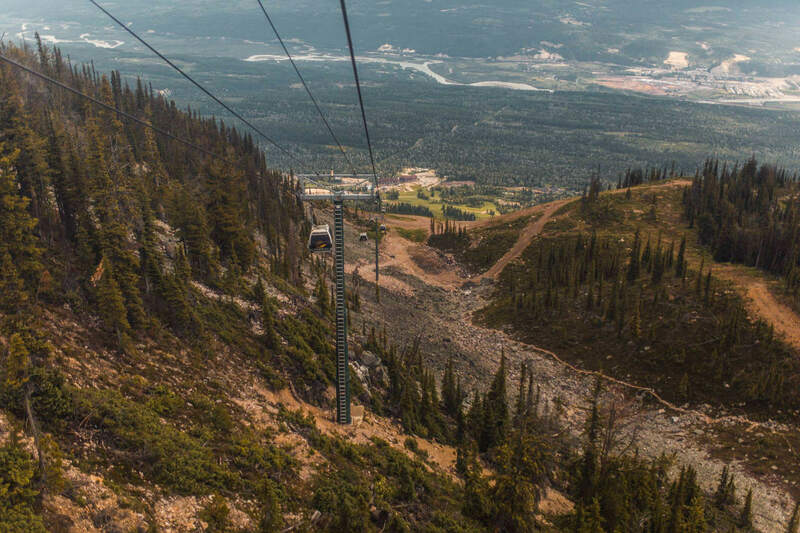 We then continued on to the Kicking Horse mountain resort, which is a popular ski resort in the area, but by summer hosts great options for hiking and mountain biking. 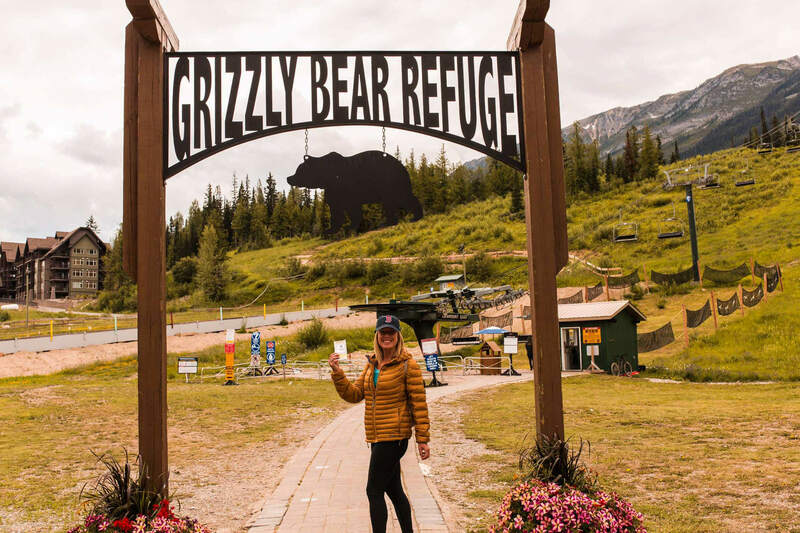 It’s also the home of the Grizzly Bear Refuge. Now I’m not usually a fan of visiting zoos or kept animal enclosures, but this one is so different. It’s the largest enclosed and protected grizzly bear habitat in the world and is home to Boo. The Grizzly Bear Refuge once adopted Boo and Caribou who were rescued at five months old because their mum had been poached. Under 2 years old, a grizzly cub is unlikely to survive in the wild on their own, which is exactly why Boo and Caribou were looked after. Unfortunately, Caribou passed away, but Boo is fighting fit and an absolute honour to be in the presence of. Why hasn’t she been released? At the time they didn’t have the research to operate the raise and release programme, so this site was used as ground research. It now wouldn’t be safe for Boo or the public for him to be released into the wild. He has very natural and extensive grounds here and is well looked after. I’ve never been as stunned or taken back by an animal’s presence before as I was with Boo’s. Truly spectacular and a once in a lifetime experience to stand this close to a Grizzly. See more about the experience here. Information: If you have time, try the Bowl Over Loops hiking trail or the Via Feratta that resides at the top of this mountain. En route back to Banff, where we had planned to check in to Irwin’s Mountain Inn, we stopped off at Wapta Falls and picked up some snacks for the 1hour 45min drive. Of course it wouldn’t be a Rockies road trip without a trip to Lake Louise. Only problem being, particularly as a photographer like myself, you’ll want to time it with the best window of weather and a morning that you can schedule an early start for. We did it on day 5 and the weather was absolutely perfect. We woke at 5am in Banff and drove to Lake Louise car park itself, which, to our absolute delight, was empty. Honestly, they have overflow car parks, shuttle buses and tourists in serious masses come here so if it’s a must for you, it’s worth the extra effort to avoid the weekend and get up at the crack of dawn. Despite not being a fan of overly touristy hotspots, you cannot deny the beauty of this place. Top tip: Grab a coffee and a hot porridge breakfast from the Fairmont Chateau hotel right on the lake front to warm you up. It’s cold before the sun rises! 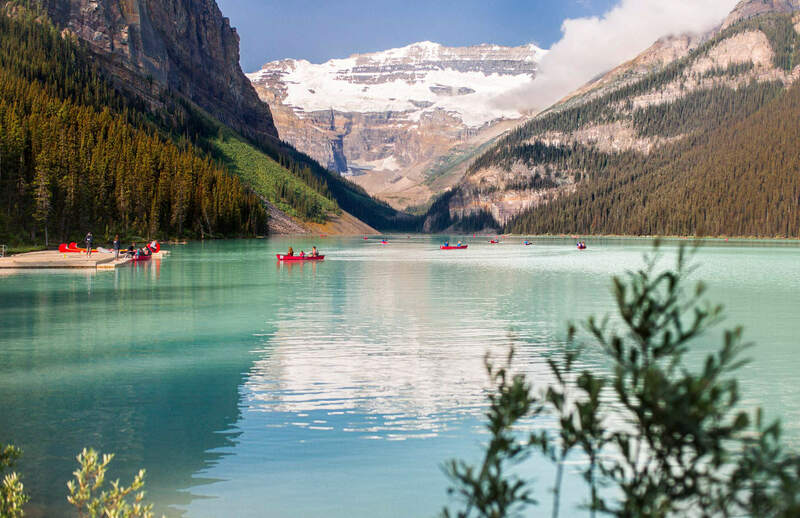 We had time to pass before the Canoe rental opened at 8am, so we had breakfast before joining the queue for that bucket list goals experience – the Lake Louise Canoe. Money tip: $115 per hour/ $105 per half hour for this experience, or $75 per hour/ $65 per half hour if you’re staying at the hotel. Find out more here. 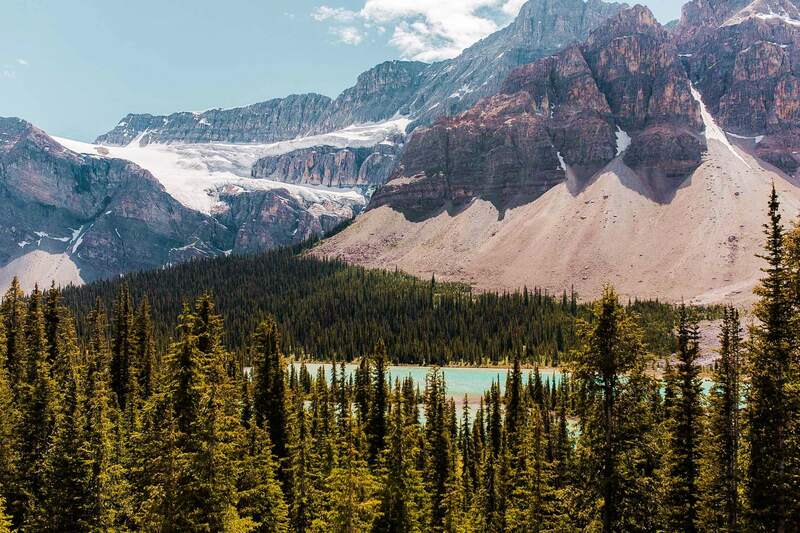 Check out some of these walks from Lake Louise if you’re planning to make a day out of it. There’s also Moraine Lake nearby which is equally as stunning, but by the time we finished at Lake Louise, the Moraine Lake car park was full and shut and we didn’t have the patience to drive to the overflow and get the shuttle. We were more than occupied with what we’d witnessed at Lake Louise. 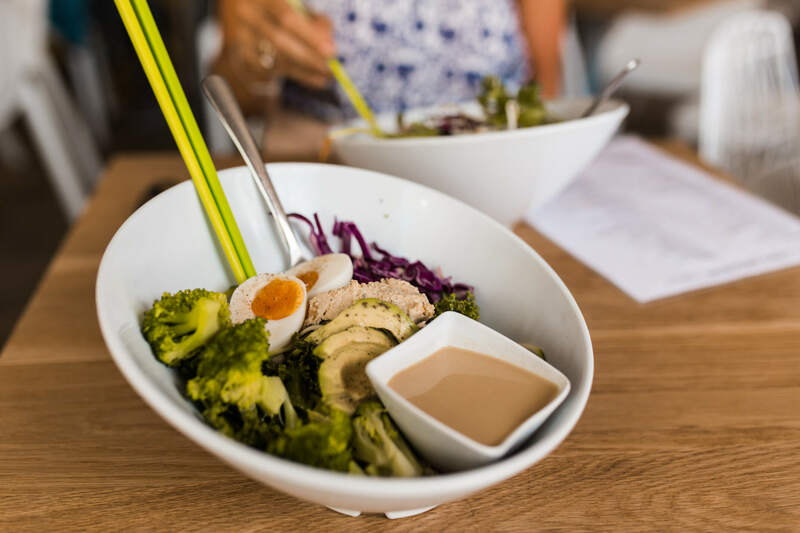 When we returned to Banff it was only lunch time, so we grabbed some lunch and a matcha from Good Earth Coffeehouse and hiked Sulphur Mountain – a local and popular breezy 45-minute hike in Banff with views over the town. On our final day before heading back to Calgary we had breakfast at the legend spot that is Touloulou’s restaurant – they specialise in Cajun cuisine. I don’t think I’d ever seen this place without a queue so on the last day, as the English do, we joined it. After breakfast we rented a canoe in town and explored the rivers that run through and around Banff before an afternoon of reading and relaxing. 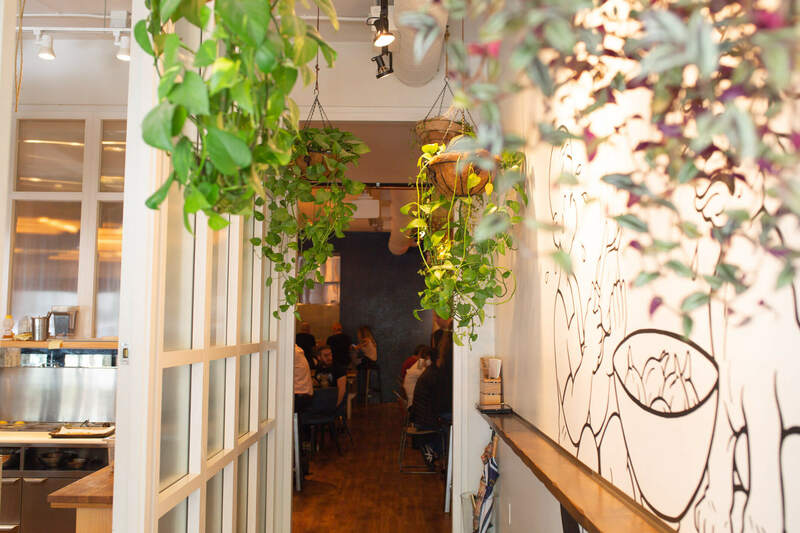 By evening we headed to Nourish (a restaurant with an insane vegan line up of dishes) and then Parks Distillery to try out a selection of their Gin cocktails, distilled fresh on the site. Top tip: the food looked awesome here and they also run distillery tours. 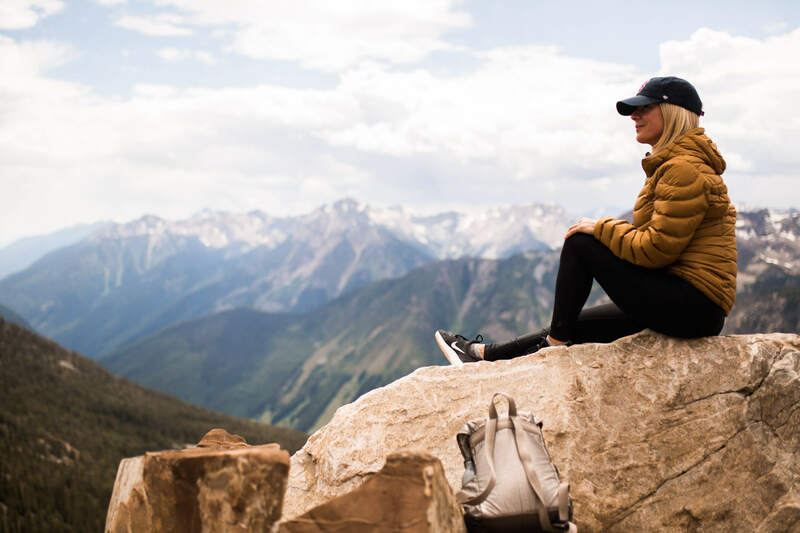 See my ultimate guide to Banff here for more information and adventure options for your time in Banff. After another night at Irwins Mountain Inn we woke and began our drive back out of the Rockies to Calgary via Lake Minnewanka. 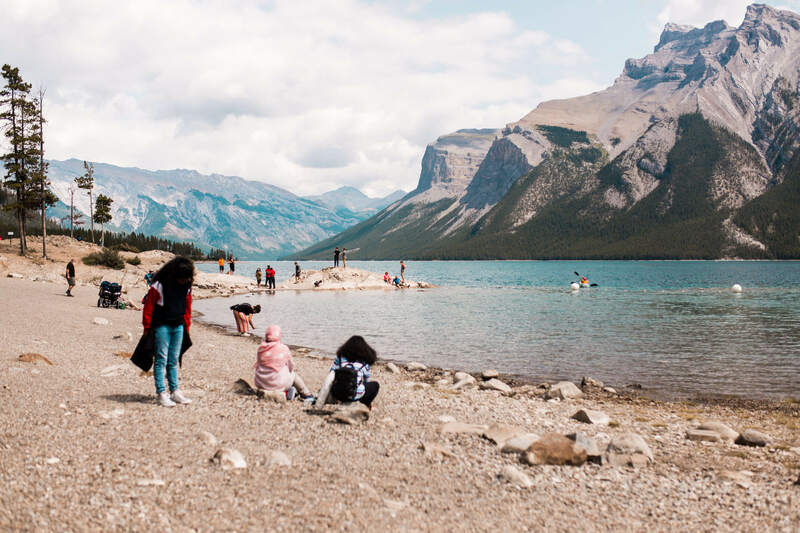 I’d be lying if I said we weren’t initially drawn in by its wonderful name, but we found it to be the most beautiful lake filled with families enjoying picnics, river cruises and setting out on hikes. We only stopped for an hour’s lakeside relaxation, but I’d definitely recommend coming and enjoying a day here. I’d also highly recommend stopping off in Canmore for lunch at Communitea Cafe for a wholefood salad / wrap / lunch. 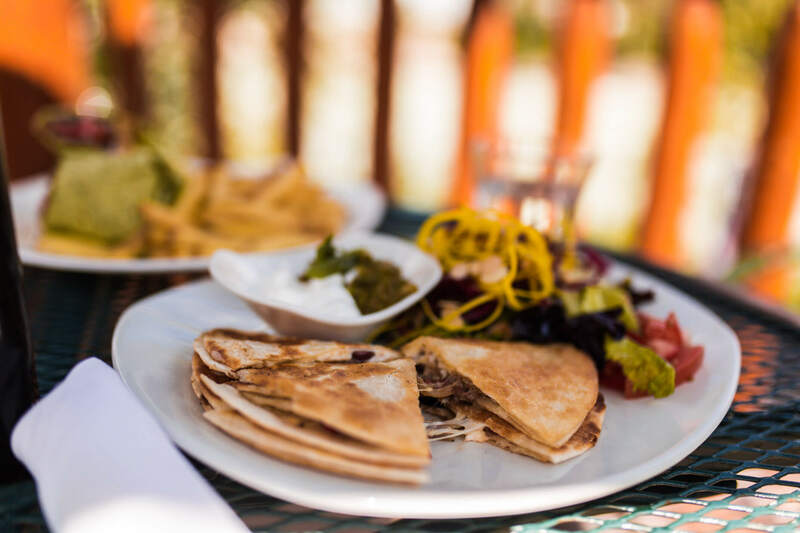 It serves up all the nutritious fresh goodness you dream about and it’s located in a gorgeous little town between the mountains. It was actually the place that most felt like home of the whole trip. It had a real, friendly, welcoming, neighbourhood feel to it.